This is one of the most advanced, complete, intensive, effective, realistic and practical Private Military Contractor HECPO course on the market place of nowadays, a 7 day intensive Close Protection Operations Advanced Skills for working in hostile environments which will provide you with effective tools. It is strictly designed to meet the needs of operatives working in high risk Countries. 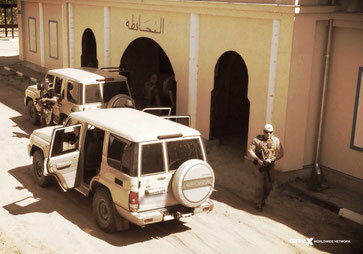 Intensive and 100% practical course aimed at tactical response in High Risk protection missions. 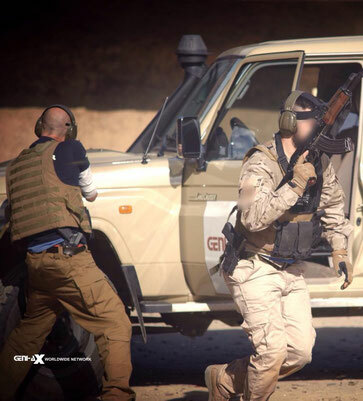 This Private Military Contractor - HECPO program has been designed to meet needs of those are working in the PSD Personal Security Details field. It’s highly suggested to operatives already deployed in hostile environments who need the most complete and effective practical training solution in this environment. Individuals or groups who are looking to work or already working in High Risk Countries in the Private Security Industry, protecting their principal in hostile environments such as Middle East, Africa and South America. MPSS & GENI-AX is a specialized consultation and services multinational. We provide military and police support services, strategic and tactical stability support, with turn-key mission solutions which ensure the safety and structured readiness of Governmental and Corporate ventures worldwide. -since the training is high demanding in terms of physical performance candidate has to be fit. Extracting the VIP from the line of fire. From a variety of emergency situations into a building, a car or other covers. Situations and responses in emergency situation on the convoy. Evacuation from an attacked car. training, food (3 meals a day), accommodation, transfer from-to airport, equipment and certificates (upon successful completion of the course), assistance to apply for the SSCS badge. MPSS & GENI-AX are authorized to act on behalf of the GENI-AX Foundation, an Israeli non-profit Organization which is registered, recognized and authorized by the Israeli Government.